Delirious was making waves in its native land of England long before its music hit the world. The band was born in January 1996, but the story of these five musicians began six years ago in Littlehampton, England. In an effort to reach British youth, the Arun Community Church started a monthly outreach service called Cutting Edge. At that time, drummer Stewart (Stew) Smith and Becca Jupp, wife of Delirious keyboardist Tim, were leading the youth group at Arun. Martin wrote new music for each of the gatherings and when he, Stew and Tim had six songs, they recorded a demo. The band became known as Cutting Edge and the tape as Cutting Edge One. Increasing demand for new music led to Cutting Edge Two in 1994; by the time Cutting Edge Three and Four were released in 1995, bassist Jon Thatcher and guitarist Stuart Garrard (Stu G) had joined. After the band went full-time, they changed their name to Deliriou5?. 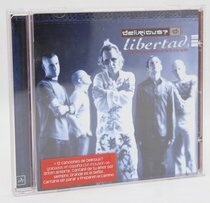 In 1996, Delirious bridged the gap between their Cutting Edge days and their more aggressive musical direction with Live and In the Can. It was then followed by King of Fools that became an international success. The band is famous with classic songs that are sung by churches all over the world. Some of these songs are 'I Could Sing of Your Love Forever,' 'Deeper,' 'History Maker,' and many more.